Selections allow you to pick a specific area of your artwork to change. There are many selection tools available that select in different ways. Once an area is selected, most tools will stay inside that area. On that area you can draw or use gradients to quickly get colored and/or shaded shapes with hard edges. The most common selection tools all exist at the bottom of the toolbox. Each tool selects things slightly differently. The links for each tool go into a more detailed description of how to use it. Select the shape of a square. Select the shape of a circle. Click where you want each point of the Polygon to be. Double click to end your polygon and finalize your selection area. Use Shift + Z to undo last point. Outline/Lasso tool is used for a rough selection by drawing the outline. Contiguous or “Magic Wand” selects a field of color. Adjust the Fuzziness to allow more changes in the field of color, by default limited to the current layer. Path select an area based on a vector path, click to get sharp corners or drag to get flowing lines and close the path with Enter or connecting back to the first point. You can also use the transform tools on your selection, a great way to try different proportions on parts of your image. The tool options for each selection tool gives you the ability to modify your selection. If you want to delete the entire selection, the easiest way is to deselect everything. Select ‣ Deselect. Shortcut Ctrl + Shift + A. In the bottom left-hand corner of the status bar there is a button to toggle how the selection is displayed. The two display modes are the following: (Marching) Ants and Mask. The red color with Mask can be changed in the preferences. You can edit the color under Settings ‣ Configure Krita ‣ Display ‣ Selection Overlay. If there is no selection, this button will not do anything. Ants display mode (default) is best if you want to see the areas that are not selected. Mask display mode is good if you are interested in seeing the various transparency levels for your selection. For example, you can create a selection with a gradient. The global Selection Mask is your selection that appears on the layers docker. By default, this is hidden, so you will need to make it visible via Select ‣ Show Global Selection Mask. Once the global Selection Mask is shown, you will need to create a selection. The benefit of using this is that you can paint your selection using any of the normal painting tools. The information is saved as grayscale. You might want to switch to the Mask display mode if it is difficult to see the results. You can create a selection based on a layer’s transparency by right-clicking on the layer in the layer docker and selecting Select Opaque from the context menu. Vector selections allow you to modify your selection with vector anchor tools. Pixel selections allow you to modify selections with pixel information. They both have their benefits and disadvantages. You can convert one type of selection to another. When creating a selection, you can select what type of selection you want from the Mode in the selection tool options: Pixel or Vector. 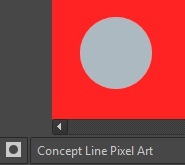 Vector selections can modify as any other vector shape with the “Shape Handle” tool, if you try to paint on a vector selection it will be converted into a pixel selection. Pixel selections can be painted with any tool. You can also convert vector shapes to selection. In turn, vector selections can be made from vector shapes, and vector shapes can be converted to vector selections using the options in the Selection menu. 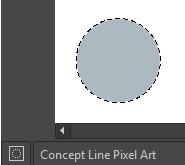 Krita will add a new vector layer for this shape. If you started with a pixel selection, you can still convert it to a vector selection to get these benefits. Go to Select ‣ Convert to Vector Selection. If you have multiple levels of transparency when you convert a selection to vector, you will lose the gray values.